By default a click on bookmarks button will result in that weblink loading in same tab. 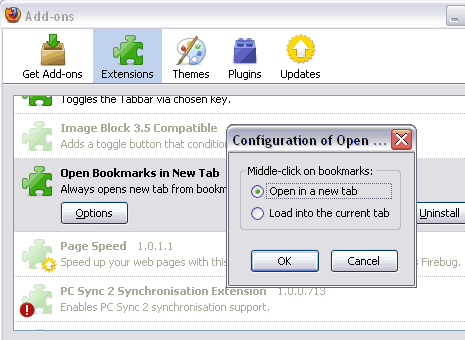 Users who often access bookmark links would like them to open in new tab for better accessibility and ease. This is possible using “Open Bookmarks in New Tab” Firefox addon. 1. Download & install this firefox addon. 2. Restart your Firefox browser. 3. Click on any bookmark link, it should open in new tab. You can also revert back to default settings to open bookmark link in the same tab. Goto menu option Tools > Addons. Then click on “Options” button on Open Bookmarks in New Tab listing, select “Load into the current tab” option and click OK. Simple addon with useful functionality in ever so customizable Firefox. Fine for laptops, otherwise I prefer middle-click for new tab, thus preserving left click for same tab. Certainly a very useful and convenient one. Previously need to right click on bookmark. Thanks for sharing!